With the ever growing multitude of technologically advanced lenses becoming available, there is probably now a lens out there for just about every visual task imaginable. As one of the largest independant practices on the Fylde, we are able to source the most suitable lens for you, our patient, from basic single vision to the most advanced individually tailored progressive lens. As an independant optician, we are free to select what we feel is the most suitable product from a wide range of quality manufacturers including Rodenstock, Essilor, Zeiss & Nikon to name but a few. We are "Platinum Plus" Club Members with Rodenstock and registered Varilux Specialist Opticians, giving us the knowledge and experience to fit lenses from a huge portfolio. The Rodenstock brand stands for technologically demanding products of exceptional quality. Rodenstock is Germany's leading manufacturer of ophthalmic lenses and spectacles frames. The company, which was founded in 1877, is based in Munich, has a worldwide workforce of approximately 4,300 and is represented in more than 80 countries. 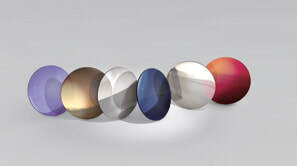 Rodenstock maintains production sites for ophthalmic lenses at a total of 14 locations in 12 countries. The competence for both ophthalmic lenses as well as for frames makes Rodenstock into a unique brand in ophthalmic optics because it can offer spectacles wearers the complete ”spectacles” system from a single source. At the heart of all activities is optimisation of the optical reproduction properties, increasing the wearing comfort and providing a design that highlights the personality of the spectacles wearer. In other words, improving the vision and the look. As "Platinum Plus" Rodenstock Club members, the Dispensing Opticians at G R Hardwick (Optometrist) have immediate access to all the very latest innovations that they develop, and always at the very best prices. Our fully validated ordering system is linked directly to the production line at their UK factory in Northfleet, Kent so within moments of an order being placed with us, your lenses are being produced. We were one of the first opticians in the UK to take delivery of the ImpressionIST 3 3D video centering system and the new DNEye Scanner to enable us to produce truly bespoke lenses based around the individual needs of our patients.